A corrosion grid from an aircraft maintenance inspection. As business aircraft fleets have aged, Duncan Aviation’s maintenance teams have observed more and more instances of corrosion on aircraft nearing 12 years of age. And we've developed a process to detect it early. Stripping an aircraft prior to maintenance proactively detects surface corrosion and minimizes the impact on the maintenance schedule. Duncan Aviation refers to this method of interrupting the paint cycle as an “out-of-sequence strip and paint” event. Here are five ways early aircraft corrosion detection can help prevent scheduling disruptions on major airframe inspections. 1. Aircraft are easier to inspect. Corrosion is not always obvious to the naked eye. Pitting can occur under the paint without any noticeable change in appearance. Only after an aircraft is stripped, will a thorough visual inspection uncover hidden corrosion. 2. Identifies surface corrosion before the paint process begins. An aircraft is typically not stripped for paint until after the maintenance is complete. If corrosion is discovered at this time, the paint process is halted and the aircraft is returned to the hangar for structural repair. 3. Allows engineering solutions and structural repairs to be worked during scheduled maintenance. By detecting corrosion early on, engineering solutions and structural repairs can take place during the maintenance inspection. 4. Can reduce downtime significantly. Corrosion found after maintenance is complete can add several weeks to the project, possibly as much as four weeks or more in extreme cases. Although an out-of-sequence event will add two to three days to the overall schedule, it allows repairs to be worked during the original maintenance schedule, potentially saving weeks of downtime. 5. May prevent the loss of a paint opportunity in a tight paint schedule. 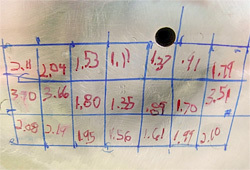 Paint slots are scheduled months in advance and can be difficult to reschedule quickly when missed. Most minor corrosion found during a out-of-sequence event can be addressed during the maintenance downtime and still be able meet the original scheduled paint slot. We don’t truly know what’s under the paint until we remove it. If an operator is concerned about corrosion on their aircraft, they may want to consider stripping the aircraft prior to inspection. It can really save downtime in the long run. To learn more about how to prevent scheduling disruptions on major airframe inspections, download the Corrosion Detection Field Guide. Duncan Aviation provides major and minor airframe inspections and paint refurbishments on most popular makes and models of business aircraft. Out-of-sequence event may be scheduled at Duncan Aviation’s paint facilities located in Lincoln, Neb., and Battle Creek,Mich. Suzanne Hawes is a Completions Sales Rep at Duncan Aviation’s Battle Creek, MI, location, specializing in Falcon paint and interior completions and modifications. Her aviation career began in 1996.